We have seen many mesh bags, but never one that comes with a set of wheels! 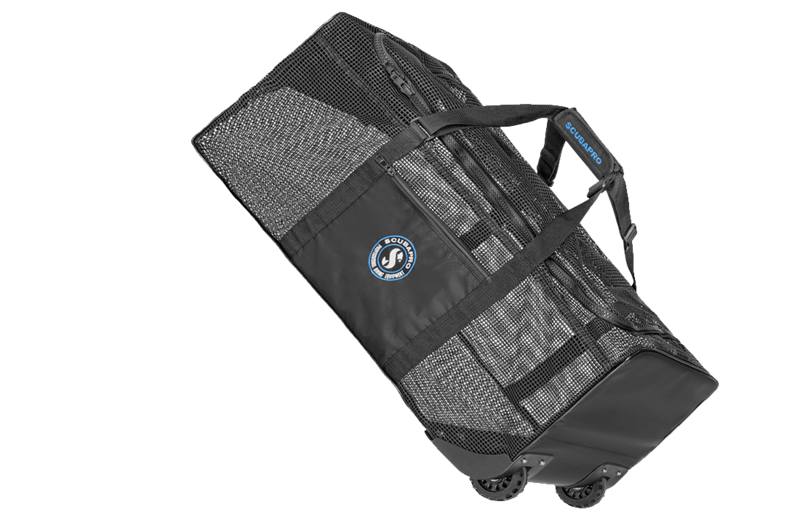 Scubapro's latest lightweight gear hauler is manufactured from a heavy-duty PVC coated mesh. This fabric should mean the resulting bag is lightweight, durable and rugged. I am a fan of mesh bags for many reasons. Firstly they are, in the main, light to carry. I do a great impression of being a bag lady lugging gear through airports, up stairs and down piers. Hence a light bag that works gets scuba points from me. I often use this style of bag for stashing my drysuit when I am boat diving - it allows my suit to start draining. (It is worth getting your boot / trunk lined though, otherwise you can end up with puddles of water in your car). The one compartment has a semi-rigid base and is secured by a U-shaped YKK saltwater-resistant zip that has two sliders. This allows you to open the lid fully, making packing a cinch. There is a small non-mesh zipped pocket on the side of the bag for your smaller valuables i.e. wallet and keys. Scubapro has taken into consideration the (rough) terrain the bag will potentially be pulled across, and protected the bag by reinforcing the corners. They have added a a top pull handle and heavy-duty off-road style wheels. And when you can't wheel, you can carry. The adjustable handles can be used backpack style or as shoulder straps. This Mesh 'n Roll bag also features a unique packing system, allowing you to fold it down so that you can pack it into your checked luggage and take it on your dive adventures.